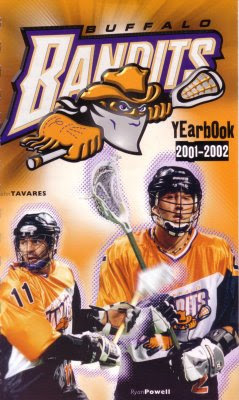 The Buffalo Bandits had gone through three goaltenders in 2001. Head coach and ex-goalie Ted Sawicki wasn't going to go through that again. To that end, the Bandits engineered a huge trade on May 18, 2001, that altered the look of the franchise. The target was Steve Dietrich, a veteran goalie who had spent the previous six seasons in Rochester and was twice a second-team All-Pro selection (1995-96). He came with Casey Powell, Rusty Kruger and Pat McCready. Headed down the Thruway were Derek Malawsky, Shawn Williams and D'Arcy Sweet. Presto - two of the team's top three scorers were gone. But Dietrich would fill a spot in goal, and Powell had all sorts of potential even though he hadn't played the indoor game since 1999. Powell, a former All-American at Syracuse, had played outdoors in the summer of 2001. "I can't remember a trade that involved this many players of this high caliber," Bandits General Manager Kurt Silcott said. Silcott had told Dietrich at the time of the deal, "This team is a goalie away and I just traded for him." The dealing continued the next day. Buffalo sent Chris Prat and Derek Collins to Calgary for the first pick in the expansion draft, and used it to take Chris Langdale. The defenseman had spent the previous four seasons playing for Ontario/Toronto. Later Randy Mearns, who had started in Buffalo in 1993, returned in a trade with Calgary for Scott Self. Calgary wasn't the only change in the league for 2001-02. The Vancouver Ravens joined the fold in April 2001, followed by the New Jersey Storm and Montreal Express in May. That left a unwieldy 13-team league that was split into three divisions. The team lost Rich Catton to Vancovuer, Phil Wetherup to Columbus, Andy Duden to Columbus and Peter Talmo to New Jersey in expansion drafts. Was that enough change for one season? Perhaps. The league even started a month earlier than normal, as the Bandits opened at home against Washington on November 24. Dietrich was the winning goalie in a 17-15 win while McCready got the game-winning goal before 6,718. But Montreal edged the Bandits, 18-17, on Dec. 1. That "win one, lose one" pattern didn't take long to developed. Buffalo beat New York and lost to Rochester, 22-11 in a game that Sawicki said, "That was one of the few times in my career where you just want to run and hide. On the bench I just felt like hiding." Derek Malawsky had 13 points for the Knighthawks. Buffalo defeated Calgary in overtime but lost to Philadelphia. The Bandits downed Vancouver but lost in Montreal. Buffalo won against Columbus, but Sawicki had seen enough. He resigned his position on February 7 with the Bandits a half-game out of playoff berth. Assistant Frank Neilsen took over on an interim basis. "Kurt [Silcott] felt he needed to make a change and I have no problem with stepping aside to take care of my baby," said Sawicki. "It was a mutual decision. I didn't feel like I was motivating the players. We felt like this was the thing to do." After a loss to Albany, the Bandits were 5-5 and looked like a very mediocre team. They tried shaking up things with a pair of trades. In swap number one, Buffalo sent forward Jamie Taylor, goaltender Chris Levis and a 2002 first round draft pick to Columbus for goaltenders Ken Montour and Phil Wetherup and Columbus’ second-round pick in 2002. Wetherup then headed to New York, and he was joined by Chris Driscoll, Jason Clark, and Rob Kirkby and new members of the Saints. Coming to Buffalo were Roy Colsey, Brad Dairon and Jonas Derks. Colsey had tied John Tavares for the league lead in goals the previous season, and it was hoped he could provide some instant offense. "It's not every day you get an opportunity to put a guy like that in your lineup," said General Manager Kurt Silcott about Colsey. "You have to do whatever it takes. We gave away a lot of talent but he's a superstar." There was still time to get a little hot and make a playoff run. Buffalo won in Columbus and then beat Philadelphia to move two games above .500 for the first time this season. Tavares had five goals and five assists. "We got into a zone and it seemed like we couldn't do anything wrong out there," said Bandits forward Mike Accursi, who scored a season-high seven points, including three goals. "Those guys just got tired, they got frustrated." But that was the high-water mark. An overtime loss in Albany was a crusher, and it was followed by defeats at the hands of Toronto and Rochester. The Bandits were 7-8 and out of the postseason again, even though six teams now made the playoffs. Sawicki gave the start in goal to Montour, his first, and he recorded a 23-22 win over Washington. Tavares padded his stats for the season with three goals and 10 assists for 13 points. That win at least got Buffalo up to 8-8 -- small consolation. Tavares was on top of the team scoring list with 88 points. Colsey added 19 in six games for Buffalo, and Accursi was third on the team in scoring with 46. McCready set a team record by grabbing 173 loose balls. Powell had signed a contract withe Bandits but never reported. Dietrich was 7-7 in goal, setting a team record by playing 845 minutes. "Steve had a great year for us, an MVP year," Neilsen said. "He played unbelieveably well, kept us in games when the defense did falter. ... Take away one stinker (a 22-11 loss to Rochester) and he was probably the best goalie in the league." Banditland needed a jolt of energy at this point, and there was a man out there who was willing to try to provide it.